Adam finds as much heart as there is roar in Lionheart the film that kicked off the 1990’s for Jean-Claude Van Damme. Being released by MVD’s Rewind Collection on Blu-Ray. I still remember the first time I watched Lionheart. Opening weekend, packed house with my dad at a Sunday Matinee. By its end, the theater erupted into applause. So many mustaches, jean shorts, and mullets were on their feet cheering on Jean-Claude Van Damme as Leon. The film worked hook-line-and-sinker for the intended audience. It was an announcement. The rise of JCVD as an Action Star, and the 90’s Action Film. More JCVD films and the like would follow but only to various degrees of success for the man and his contemporaries. 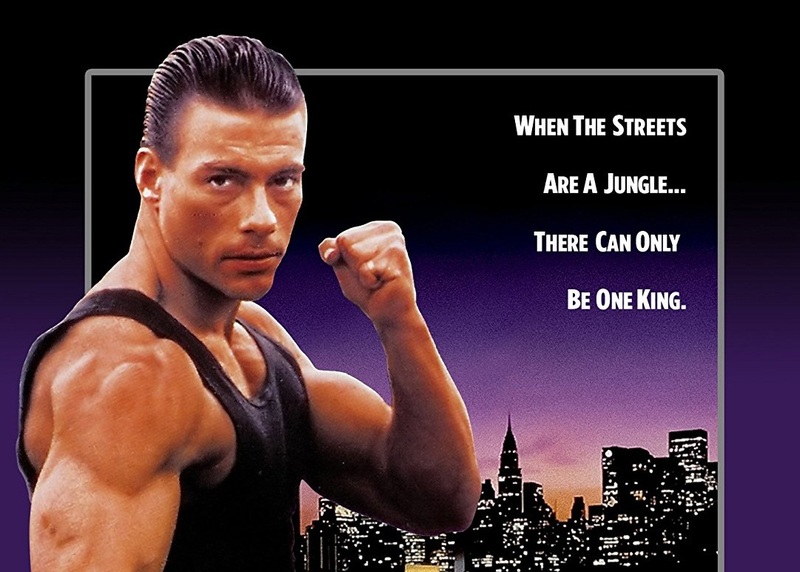 After 28 years Lionheart remains one of Van Damme’s best films. It’s parse streamlined story (taken very liberally from Walter Hill’s classic Hard Times), it’s emotional beats, its action, and its adroit use of Van Damme all contribute to the success of the picture. Though ultimately it is co-writer/director Sheldon Lettich’s work that pushes this standard by-the-numbers fight picture to something more than your standard low-budget action fare. There is an unfettered utilitarian style direction that Lettich uses. There are no tricks. Just lean and economical direction that’s all aimed at telling the story in the best possible manner. Many an action film in the vein and during this era went to a more and, ultimately, unwarranted stylish approach to the direction and fight choreography. That leaner economical style recalls Walter Hill’s in the best way possible. Leon (Van Damme) a French Foreign Legoniare is told of the violent attack on his brother in America. The Legion will not let him go to see his brother and his brother’s family, in America, who is close to death. Six from release, Leon risks everything to go AWOL to help his brother. The journey finds Leon desperate for money and forced to fight in an illegal street fight ran by Joshua (Harrison Page). Joshua both helps and endangers Leon’s journey and eventual attempts to help his brother’s family. Forced to do the only thing he knows that will help his brother’s family, Leon begins to fight in illegal fighting tournaments at various locales in and around Los Angeles. Scheming fight promoters, Legionaries in pursuit, and even his own manager all conspire against Leon. Lettich and Van Damme’s (he was the co-writer) script relies heavily on Hill’s Hard Times as its inspiration. Not a bad thing as both actor and direct have seemed to learn the right lessons from Hill’s movie. Rather than a terse story of “men being men”, they have written an emotional story of triumph and sacrifice for family. Leon does not fight for glory or even the money per se, he fights for survival. Not just his own survival but that of his brother’s wife and daughter. Lionheart is almost timelessly sentimental. In the best way possible it feels as though Lettich and Van Damme want to make the fighting version of The Grapes of Wrath. There is an honest socially conscious aspect to the film that separates this from anything in the era. Its done without any sort of grandstanding and with a matter-of-factly tone that doesn’t take it to laughable territory that like Segal’s On Deadly Ground 4 years later. At its core Lionheart is an earnest throwback to a forgotten Hollywood Golden Age tradition; the crowd-pleasing depression era fight film. The troupe may be old but Lettich manages to put a shiny new coat on it, reimaging it for the 90’s JCVD action crowd. The results is an A-Picture Crowd Pleaser on a B-Picture budget. The transfer for the Theatrical Release is beautiful well balanced sharp image. The source transfer that MVD received is beautifully rendered, it seems to be the same transfer from the Van Damme 5-Movie Action Pack that Universal released a few years back. Thankfully this isn’t a bad thing as the transfer was solid. NOTE: the release comes with the Extended Cut of the film as an extra feature. The transfer’s quality is markedly different and varied throughout this extended cut. Thankfully, they have “spliced” in the extended moments from those various sources. The result is a bit of a Frankenstein stitched together quality to the proceedings that allows one to see what they cut out. This reviewer did not find the jumps in quality distracting but it should be noted as some might. The set comes with the Original Theatrical Cut and the Extended Cut. The Extended cut is about 6-minutes longer and features some odds and ends that flesh out the characters a wee bit more and some additional violence that was cut to secure an R-Rating. Overall the Extended Cut is a nice addition but you’ll want to stay with the shorter Theatrical. Lionheart: The Inside Story is a newly produced 48-minute making-of featuring interviews Jean-Claude Van Damme, Sheldon Lettich, Producer Eric Karson, and Harrison Page, Deborah Rennard and Brian Thompson. This is what you want in a making-of documentary. Much like the Rewind Collection of Black Eagle release, this doc leaves no stone unturned. There is an honesty here that makes for a fascinating look at the making of what is the movie that really cemented Van Damme as an Action Star. The doc focuses primarily on the script and production of the film. Inside Lionheart with the Filmmakers and Cast also newly produced 26-minute documentary that complements The Inside Story focuses more on the scripting, but adds much about the post-production process, and release and reception of the film. One of the most interesting moments is Karson and Lettich discussing how the Negative Pickup informed on the politics of the film being re-titled in almost every region from the very horrible title Wrong Bet to Leon to A.W.O.L. to Lionheart in the US. Lionheart’: Behind the Fights another newly produced featurette that complements the prior two documentaries. The 10-minute doc focuses on the development and execution of the fight choreography that Van Damme, and Frank Dux (of Bloodsport infamy) created for the film. Fight choreography oftentimes gets the short shift on special features, making this a welcome addition. The only minor complaint is that it isn’t long enough! One would have been even happier if this was double or even triple in length. The Archival Making Of featurette is an EPK straight from 1990 with the “Trailer Guy” doing the voiceover explaining everything in this 8-minutes of retro goodness. This making-of is one of the true delights of this set and well worth taking a look at. Both interviews from Lettich and Page come from an earlier German Blu-Ray release of the film with a strange format of having the questions they pose to the director and actor come up onscreen for you to read before they answer. Both interviews are fine and much of what’s gone over is covered in the commentary and the making-of special features. Rounding out the extras are the Theatrical Trailer, 5 Promotional TV Clips, and a Still Gallery. Both the trailer and TV Clips seemed to have been pulled from older sources which definitely give them a 90’s VHS quality kitsch to them that many will love. Also included is an audio commentary by Lettich and Page. MVD Rewind Collection has gone all out with this stacked edition of Lionheart. A combination of New Featurettes, Archival Featurettes (from Non-US Region Releases), and some great surprises make this the best Rewind Collection yet. This is in contention for a “Best of the Year” for Blu-Ray releases. Bravo MVD… Bravo!!!! HIGHEST POSSIBLE RECOMMENDATIONS!!! !